As the Lok Sabha 2019 elections come closers, the political cloud is filled with a buzzing tension. It takes every citizen of the country to decide the fate of India. Amid the general elections, many Bollywood celebrities have come forward to raise the awareness of voting. However, Alia Bhatt recently found herself in troubled waters after her statement of being a British citizen went viral. 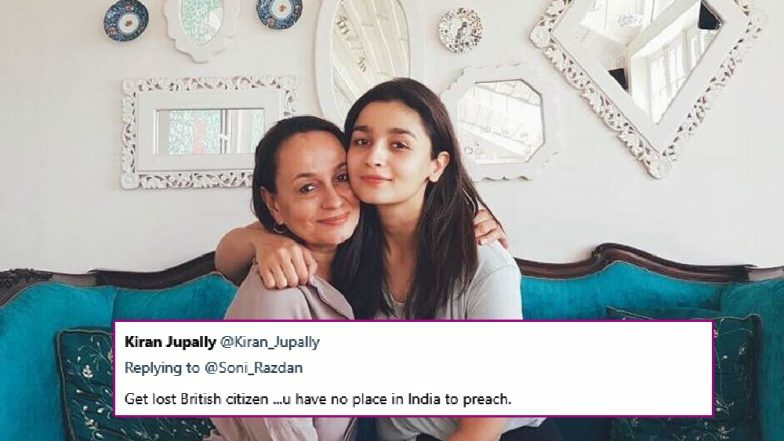 On the other hand, Alia’s mother Soni Razdan was also trolled heavily on social media for her post on Twitter requesting Indian voters to remember Junaid Khan before they cast their vote. Alia Bhatt and Her Mother Soni Razdan Can't Vote in Lok Sabha Elections 2019, Here's Why! The Raazi actor was recently quizzed during Kalank promotions whether she’ll vote, to which Alia revealed that she cannot vote because she holds a British Citizenship. Meanwhile, her mother tweeted about Junaid Khan who was stabbed to death on a train near Ballabhgarh in Haryana. She took to her Twitter handle to share a misleading picture and requested the Indian voters to keep him in mind before voting. Soni was trying to imply that Junaid was killed for being a Muslim, despite the courts having already cleared that the cause of his murder was the spat over seat-sharing in a train compartment. This led to a heavy trolling on social media and agitated netizens asked her not to interfere in India’s business, as the mother-daughter duo hold British citizenship. Soni has finally given a fitting reply to all the hateful comments. She also confirmed holding a British passport but exclaimed that it does not prevent her from commenting on the malaise in Indian Politics. PM Narendra Modi Requests Alia Bhatt, Deepika Padukone, Akshay Kumar to Appeal Fans to Vote, But Can They Vote Themselves in India? The debate on the citizenship status of certain Bollywood celebrities has created a row of controversies in this year’s general polls. A report published in the Quint website also states that apart from Alia, Akshay Kumar too cannot vote because he was a Canadian citizen.